UU’s Sylvia Hudson drives to the basket during Wednesday night’s game with visiting Tiffin. 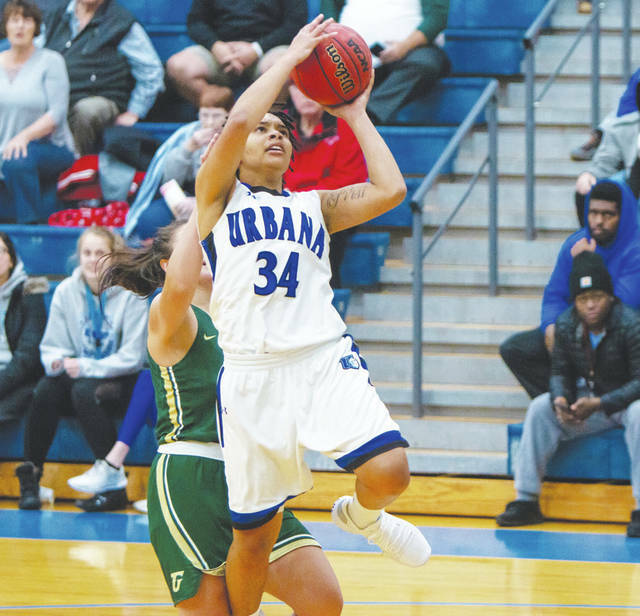 The Urbana University women’s basketball team opened up regular season action at home against Tiffin University on Wednesday night with a last-second 77-75 loss. Five players made their Blue Knight debuts, which included Bailey Draughn, Sa’Dera Johnson, Kami McEldowney, Sydney Moore and Nikki Current. At the half, UU was down, 36-29. Freshman McEldowney led the team with 10 points and Megan Beachy had a team high of three assists. With five minutes left in the fourth quarter, Beachy hit a three to give UU the lead, 62-61. Then, with eight seconds left, McEldowney canned a layup to tie the game, 75-75. Tiffin’s Ali Schirmer had the game-winning layup with two seconds left on the clock. The Blue Knights had a total of 50 bench points while the dragons had 34. Tiffin had 29 fast-break points and UU had 16. UU had four players who hit double digits in scoring: Sylvia Hudson (16), McEldowney (12), Beachy (12) and Taj Thompson (11). For Tiffin, Aarion Nichols had a team-high 16 points. The Blue Knights will start conference play this weekend when they play at UVa-Wise on Saturday at 2 p.m.
https://www.urbanacitizen.com/wp-content/uploads/sites/36/2018/11/web1_uuhudson.jpgUU’s Sylvia Hudson drives to the basket during Wednesday night’s game with visiting Tiffin.